This is what is commonly reffered to as the Flower of Life, AKA: the Daisy of Death, and is somehow passed as ‘sacred’ geometry. The metatronic code problems began billions of years ago in another time matrix with the fall of a specific collective. The point is that the metatronic code is not a new thing and certainly the FOL was not something Drunvalo came up with. He is simply one of the contemporary sources who are promoting it. There are lots of wonderful things in Drunvalo’s teachings but the core of what he is getting at in his teachings is the Metatronic code and his unnatural way to spin your merkaba which causes molecular compaction of the seed atom leading to a loss of eternal life status (ie. metatronic). The reason it is seen in so many ancient cultures is because various people and collectives where actively promoting it then just as they are now. In the FOL pattern the diagonals are set at 60 degrees. 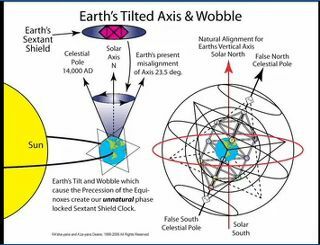 This is an unnatural energetic and geometrical relationship that prevents the spheres from phasing correctly with the top sphere (think 3 balls like a pyramid), thus preventing back flow return from god-source. When spheres can’t phase and spark correctly, they become cut off from the normal flows of eternal life currents and become metatronic. The metatronic code is therefore based on 2 spheres (vesica pices) instead of the eternal life 3 spheres (tri-veca phase unit). The FOL is simply taking the vesica pices and expanding on it. Once you can spot this 60 degree diagonal (vs 45 degree in Krystiac eternal life structures) you can easily differentiate between Krystiac and metatronic easily. Most crop circles are based on the FOL geometry of 60 degrees so it’s easy to determine the agendas behind them.The FOL geometry is a soul harvesting net. It forces peoples Merkabas to spin in ways that (long term) prevents ascension. A method that perpetuates the paradigm of taking a soul, as opposed to giving. Keeps one in the Lower Self = EGO. Connect to your heart space and ask SOURCE that all mutations in merkaba spin be cleared and cleaned away.Activate with intention [Pale SILVER + clear bright WHITE light] all as one colour.Activate this colour as a pillar or sphere. Then cleanse each chakra with crystalline WHITE light (sphere or pillar) around your entire body, that reaches beyond the head & beyond the feet. I also highly recommend the study of the energy mechanics, and the practice of the dynamics in Keylontic Morphogenetic Science. Begin with the Maharic Shield to anchor the D-12 un-distorted Krystic frequencies. Now you can ascend correctly (if you choose to), by Trusting your HEART & cleaning up your EGO. Ascension only occurs when based on truth, light and wisdom of the HEART. The flower of LOVE and its infinite possibilities exist as your infinite and loving heart. It is not confined to any geometric pattern. It is free to be itself - it is source in manifestation, capable of infinite greatness and unconditional love. The geometries, I kind of like them and they are pretty to look at, at first, but then i start to feel the underlying intent behind them and the frequencies they carry, which are ‘metatronicly’ tuned. What this pic actually represents more than anything else, is Molecular Compaction. This all ties in with the Blank Slate Technology (BeaST) and the ‘666’ metatronic alignment code. It means to digress from the original “Christos” Divine Blueprint. When the Precise Mathematical-Geometrical Instructions for Perpetual Motion of the Original Creation Program - the Krist Code - from God Source is altered or modified in any way (Anti-Christiac Expression), the self-regeneration abilities (perpetual life) of the manifest forms is interrupted leading to destruction of the corresponding matter-form via self-annihilation of the Partiki units (pre-matter units of conscious energy). This is the Metatronic (Anti-Christiac) Code Configuration (Reverse Mutation) and unfortunately for anybody who seeks true self master and empowerment, or ascension into eternal life spirals, this is a seriously abundant problem in the spiritual movements these days. When this happens the manifest being is unable to fulfil the Primal Purpose and maintain the Primal Condition - this is the Fall. The ‘fall’, due to Metatronic Code Configuration, is the result of excessive misuse of Free Will Choice of Opposite Expression of Divine Intention reaching a point at which it jeopardizes the Perpetual Motion, Eternal Life expression and continued existence of Cosmic Order. The word metatronic, is actually derived from ‘Metatron’, which is not just a singular ‘Arch-angel’ as taught in most nu-age and qabalistic circles, but is the name of a family collective; a family collective out of an entity. An entity is the first level of Ascended Masters consciousness collective. The Metatron collective fell, loosing its Krist Code encryption because there is a law of physics that says that if you are an Ascended Master being and send in more than a natural proportion of your energy into the time matrix, say for a salvage mission, if the salvage team you sent in goes down, it takes the whole collective down. I believe this is exactly what happened. The collective made a decision that it would use its knowledge of Primal Creation Physics, and that it would take over this time matrix. (That was originally what its fallen parts had wanted, and what the rest had tried to stop). They were able to create a way of feeding energy off this time matrix and off the Phantom Matrix into their Time Matrix. If those two matrices (ours and phantom) were severed, they would go into implosion eventually. They’d get a few billion years of evolution out of it, but, eventually, they would be a deteriorating system. They would become extinct in terms of the race identity that they held. They would go back to Source as space dust, which is, as fragmented units of consciousness (Oblivion) and that was unacceptable to them. They created artificial light through a particular synthesis of mathematics producing a totally polarized light through this process. In their universe, everything is bi-polar. 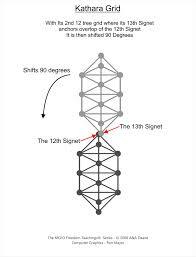 The Metatronic bodies that were created through their programming are very interesting structures. They take part of what would be a normal living biological structure, and they take out certain parts of the template that are missing and they plug in certain parts of the template together. When there’s not 30% left of the original template where you can do bio-regenesis to plug it back in to its natural Divine Blueprint. It creates an atrocity and it creates something that is not compatible with the mathematics or the scalar frequencies of the Christos Divine Blueprint for this Time Matrix or any other one. So, in making a choice to be immortal, they made a choice to be finite, because their immortality is dependent on sucking energy from living things, living matrices. They take no responsibility for the fact that they’re the ones that created this blasphemy of science. They sealed their own destiny when they created the Metatronic distortion. And at this point, they are simply trying to feed on whatever is available. These fallen, finite geometries are the main tools used. These metatronic frequencies are not just an issue here for Earth, but for the whole universe and it’s multi-dimensional anatomy. It’s not like this pic is going to kill you or anything lol, don’t get me wrong, i actually like it, so long as people are aware of the underlying energetic coding that is present and it’s subtle effects on our own multi-dimensional anatomy. Prime examples of metatronic geometries and frequencies, that i will share with you but spare you the details are: the un-natural and inorganic ‘Golden Mean(ie)’ spiral, Phi. Any geometry based upon the Fibonacci formula (AKA; Fib-of-no-chi). Proportions used in this pic seem to be aligned with them. The Golden Mean & Fibonacci spirals have no direct connection to their centers. The rectangles & squares being empty have little inner structure. They need external structures to get them going. They are progressively removed from Source. In it’s early stages the Fibonacci spiral isn’t a proper spiral. As it expands it approximates to the Golden Mean spiral, but only to a scaled down version of it. The Fibonacci spiral doesn’t have in inner spiral, i.e. it’s incapable of converging towards the center. If we think of each number as a quantum of energy, then the two previous numbers are “added together” and consumed in order to “become the next number,” leaving nothing in their place; the “numbers before” become “finite quanta” that must “disappear or die” in order for the next number to be “born.” Thus the “numbers” within the Fibonacci sequence ALL represent finite energy forms that will be consumed and cease to exist, in order for the next generation to emerge. Also, there is The Torus, but what i know it by as The Poison Apple, or Gravitron. The Gravitron is a part of the BeaST (Blank Slate Technology) machine that hold the tilt of planet Earth at it’s un-natural and artificially sustained 23.5 degrees angle and is becoming aligned with the natural Earth’s Staff. First seeded in Density-3 (Harmonic Universe 3, dimensions 7, 8, 9) 570MYA by the Metatrons (Budhara-Shan-tar-eL) and continued by the ThE-tans, the Gravitron vortex networks was linked between our Sun and Earth twisting the Tauren up side down in a unnatural configuration called Demon Seed.The Planetary Reusha-tA spiral is harnessed and turned into a set of vortices (The gravitron) which creates an unnatural artificial gravitational field on this planet and is one of the things that one has to override in order to levitate or fly again. The Gravitron is an electromagnetic harness field that is part of a larger electromagnetic harnessing structure called the Net that anchors at a particular angle in Mexico through the Mayan Temples kicking more storms since it has been progressively activated. (2005)All these Gravitron vortices doing the wrong thing generates the Poison Apple field, which is a configuration of energy that holds the 23.5 degrees tilt on the Earth’s planetary axis. (Staff)These are Black Hole technologies that were orchestrated on purpose by which this planet has been imprisoned for quite a long time. You will see these on an unfortunate and massive uprise as time moves on now (Seen the movie Thrive? a good example)There is also “Metatron’s Cube”, google that if you’ve never heard of it, but beware of any accompanying information which is more likely than not, fallen, biased, spiritual propaganda. What is ‘false’ ascension science? “False Sacred Science” teachings, and the inorganic environmental and biological consequences created through their use, are built upon convoluted, self-serving perversions of the organic Laws of Multidimensional Physics. Applications of these “twisted multidimensional science” teachings,historically engaged on Earth throughout different periods over many thousands of years, has taken a terrible toll on human evolution and on the state of our planetary environment. The MCEO Freedom Teachings® have also provided a progressive program of studies in advanced multidimensional anatomy,including studies of: 15-Dimensional Anatomy; the 15-Chakra System, Axiatonal & Meridian Lines; the Light Body, Rasha Dark-matter Body, Elum’Eir-adhona Spirit Body, Aah-JhA’ Hydro-acoustic Body and Jha-DA’ Body; fetal integration, Bhardoah, growth cycles, Evolutionary Ascension Cycles, DNA, and much more. 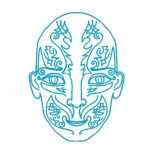 Progressively since 2000, the CDT-Plate translations and MCEO teachings have revealed many long-hidden secrets pertaining to the “Science of Ascension,” which includes the organic processesof interdimensional and trans-dimensional atomic Transmutation, Transfiguration, Translocation and Transmigration. In our learning of the actual organic processes by which — and cosmic structures through which — the bio-spiritual dynamics of “Ascension” can occur, we have also received an extensive amount of information on the intentional historical distortions of “Ascension Science teachings.” Through learning about the organic intricate structures, genuine processes and Natural Laws of Multidimensional Physics through which actual “Bio-Spiritual Ascension” (for “planets or people”) can take place, the falsehoods carried within “false Sacred Science” teachings became progressively more obvious by comparison. During the ancient Atlantean period, there was one particular body of “false Sacred Science” teachings that emerged among Earth cultures after one of the GA-MCEO CDT-Plates was stolen and placed in Illuminati hands. The CDT-Plate revealed many advanced teachings of organic “Sacred Science,” which Illuminati-Elder forces then twisted to form a particular “wormhole technology” through which they could seek fulfillment of their “Earth Templar Dominion” agenda. (Historical information on the stealing of the CDT-Plate and resultant ancient dramas is found in Voyagers Volume-2, 2nd Edition.) In ancient cultures, this particular body of advanced twisted “false Sacred Science” teachings that emerged, along with its resultant technologies, from perversion of the CDT-Plate teachings, was casually known as the “Bloom of Doom” technologies.This ancient name was adopted in reference to one of the primary inorganic “energy distortion geometries” used in this “Death Science,” the structure of which, in common respects, resembled a “blossom.” Other characteristic components of distorted mathematics and physics were also inherent to the “Bloom of Doom” Death Science. Components related to the “Bloom of Doom” technologies included a distorted mathematical growth formula for artificial finite life that in later days became known as the “golden mean rectangle” and “Fibonacci spiral & sequence,” both of which were distortions of the “Krystal Spiral & Sequence” organic eternal-life growth ratios illustrated in the GA-MCEO CDT-Plate teachings. 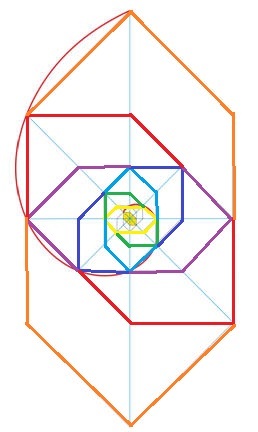 The Krystal Spiral is based on the Kathara Grid. Kathara Grids rotate around their common Azur-A center and expand from there. This Azur-A center is the center for the Krystal Spiral. The Spiral holds connection to this center at every stage. The points on the Krystal Spiral are connected to the center by the central vertical lines of the Kathara Grid. These form arms or radii for the spiral. The Krystal Spiral expands by √2 = 1.414.. for every 45° or by 2 for every 90° of rotation. 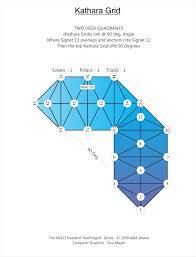 This derives from the height to width ratio (2) of the Kathara Grid. The number 2 is key to the Krystal Spiral. The Krystal Spiral forms a smooth exponential spiral that looks the same at every scale from the microcosmic to the macrocosmic. 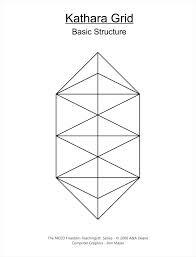 Krystic structures support an open living universe with full higher dimensional connections and direct connection through center to Source. 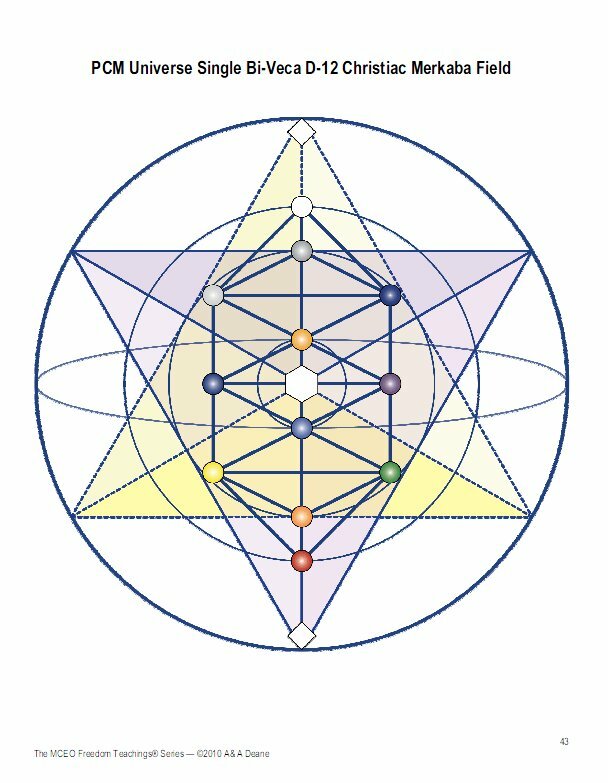 They derive from the Kryst Code, which embodies original intention for creation as expressed through the Kathara Grid, Krystal Spiral and subsequent structures. 1) The ratio between successive numbers is the Krystal Spiral ratio of 2. 2) The Krystal Spiral can be generated by addition as well as by multiplication. 3) This addition / inclusion of all earlier points is a key distinguishing feature for the Krystal Spiral. 4) Every number is the sum of all the previous Krystal numbers plus Unity. 5) The Krystal Spiral has a very regular spiral structure with simple well behaved math. 6) We get the primary number sequence for the Krystal Spiral by adding all the previous numbers, not just the last two, as it’s the case with the Fibonacci spiral which creates a progressively greater separation and isolation from Source. 7) It is symmetrical, centered and aligned with the Kathara Grids that generate it. The “Krystal Spiral” has a direct, immediate and permanent relationship with its own center-point of creation, whereas the Fibonacci golden mean spiral, which is relatively based upon the geometries of the “golden mean rectangle,” has a de-centralized start point of expansion, rather than a centralized “center-point” of creation. The Krystal Spiral/ Sequence emerges from its center-point of creation — to which it perpetually retains a living, “breathing” (expanding and contracting) connection through preservation of what “came before” — and it expands through multiplication of that which came before. 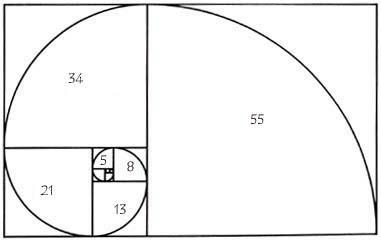 The golden mean–Fibonacci spiral/ sequence emerges from a “point of adhesion” to a living/ breathing form, to which it progressively loses contact, as it expands perpetually through consumption and annihilation of that which came before. The MCEO Guardians humorously refer to the golden mean–Fibonacci spiral/ sequence as the “Fib Of NO Chi (energy)” mechanics; the simple differences of logical/ intuitive implication between the “Krystal” mechanics and the “Fib” mechanics provide a comparative illustration of the core differences between and intrinsic natures of the respective greater “creation paradigms” each system of mechanics represents. Throughout the MCEO Freedom Teachings® many “direct” and “implied” differences have emerged between MCEO teachings and other paradigms, and with each comparative, a relative “body of reasonable doubt” has grown in relation to some of the other paradigms. 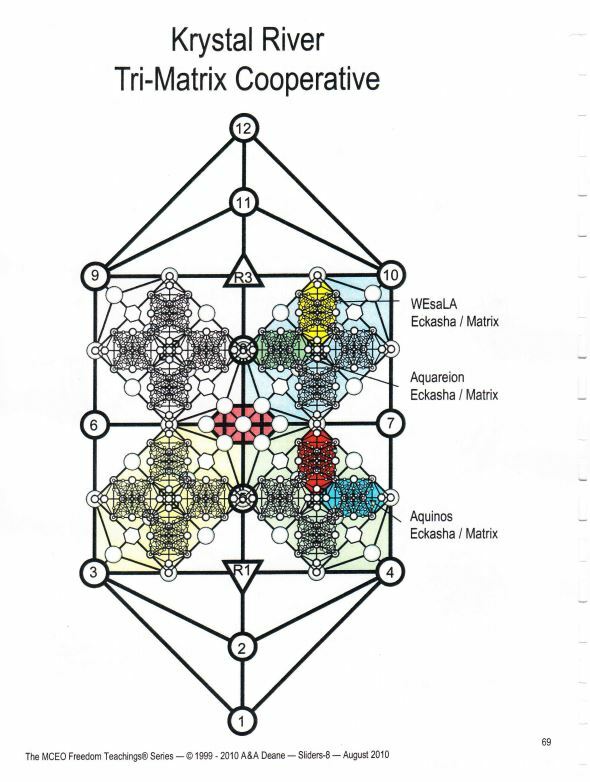 Metatronic structures can be traced to their origins in Krystic structures. They represent distortions from them. 1) Starting from 0 & 1 add progressive pairs of numbers to get the next number. 2) Every number is the sum of the previous two. 3) The ratio between each pair of numbers approaches the golden mean ratio Φ, e.g. 55 / 34 = 1.618..
4) Each number has connection to the previous two only. There is progressively greater isolation from Source. The dynamic of Merkaba Field “Vulnerability” to Free Will Choice allows manifest beings the opportunity to explore Free Will Opposite Expression through “life lessons” brought about by Cause, Effect and Consequences, in which the experiential illusions of “Limited Supply” and “separation from God-Source” can be explored. The Krystal Spiral has a very regular spiral structure with simple well behaved math. It is symmetrical, centered and aligned with the Kathara Grids that generate it. The Krystal Spiral is much stronger and expands more rapidly than either the Golden Mean or Fibonacci spirals. 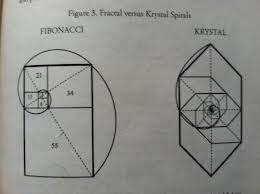 Even when the Golden Mean or Fibonacci spirals start further out the Krystal Spiral will always over take them. Another component of the ancient Atlantean “Bloom of Doom” technologies emerged through distortion of the CDT-Plate symbol called the “Kathara Grid.” Distortions of the CDT-Plate Kathara Grid symbol became known in the “Death Sciences” of the Atlantean period as the “Tree of Artificial Life,” because temporary, inorganic, finite-life artificial structures of matter, light and biology could be created through the “twisted mathematical secrets” implied by the symbolic structure of the Tree of Artificial Life distortion. 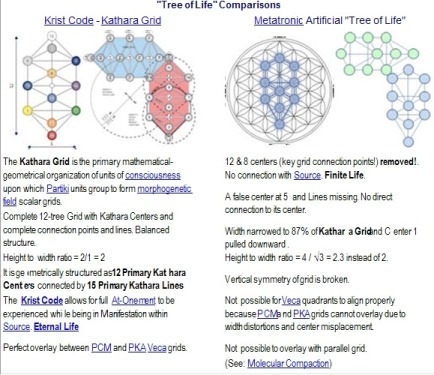 The genuine Kathara Grid represents the organic core mathematical radiation-structures, or “lattices,” upon which eternal-life “living” morphogenetic field–matter templates are built. The mathematical relationships depicted within the organic Kathara Grid symbol represent the literal “core mathematical formula”of organic radiation-lattice structure,numbers of which lattices group together in very specific geometric-mathematical patterns— forming the structure of organic multidimensional radiation templates upon which “dark-matter,” quarks and subatomic particles organize into structured manifest atoms and forms. Distorted versions of the CDT-Plate original Kathara Grid symbol emerged through the “Bloom of Doom” teachings in Atlantis as the “Tree of Artificial Life” symbol, which originally depicted 11“Signets” instead of the organic 12, and which had specific structural distortions within the shapes and proportions of the “cross-bar lattice.” The organic “living” Kathara Grid symbol represents the literal “core mathematical formula”of organic radiation-lattice structure for the eternal Living Cosmos. Likewise, the various versions of the “Tree of Artificial Life” symbol represent a distorted, contrived, inorganic “creation formula” through which unnatural multidimensional radiation template-structures can be artificially created — by abusing the Natural Laws of Multidimensional Physics— to harness and direct the organization of “dark-matter,” quarks and subatomic particles, in order to form inorganic, finite-life artificial structures of light-radiation, and atomic and biological form. The “vesica piscis” symbol is a set of 2 interlinked circles with the inner-most “outside edge” (circumference) of each circle touching the center-point of the other circle. Within the CDT-Plates, this symbol was originally called the “Bi-Veca Code,” and it, along with its 3-circle Tri-Veca Code symbol counterpart, referred to specific organic structures, processes, functions and interrelationships inherent to the organic multidimensional electromagnetic frequency spectrum, and especially to the organic creation mechanisms and natural dynamics inherent to light-radiation and the organic Living Light structures upon which the eternal Cosmos is built. Within the CDT-Plates, both versions of this symbol were depicted with a circle around the symbol, and both were referred to as the “Hierophant” symbol, which depicted the mathematical formulae and multidimensional structures inherent to “Merkaba Fields.” Merkaba Fields are organic energy vortex structures that are part of the natural multidimensional “circulatory system” of the Living Cosmos, and which under certain conditions inherent to the Natural Laws of Multidimensional Physics, can become “vehicles of transport” within the organic processes of Genuine Ascension. The Bi-Veca Code/ “vesica piscis” and the Hierophant 6-pointed star/ “star-tetrahedron” symbols, and the “Ascension Science” teachings corresponding to them, were part of the original “Sacred Science” teachings contained with in the CDT-Plate that was stolen during the Atlantean period. In the hands of the Illuminati, the Bi-Veca and Hierophant symbols and their corresponding bases of knowledge were, like the “Kathara Grid” and “Krystal Spiral,” distorted: first into the “Bloom of Doom” technologies, and later into a variety of “Death Science” teachings and practices used by competing Illuminati groups in their quest for Earth Templar control. Unlike the visibly discernible distortions of the Kathara Grid and Krystal Spiral symbols, Bi-Veca Code and Hierophant symbol distortions were not immediately noticeable; instead, the distortions were contained within the twisted teachings of finite-life energy mechanics that accompanied the symbols, while the image of the symbols themselves looked relatively the same. 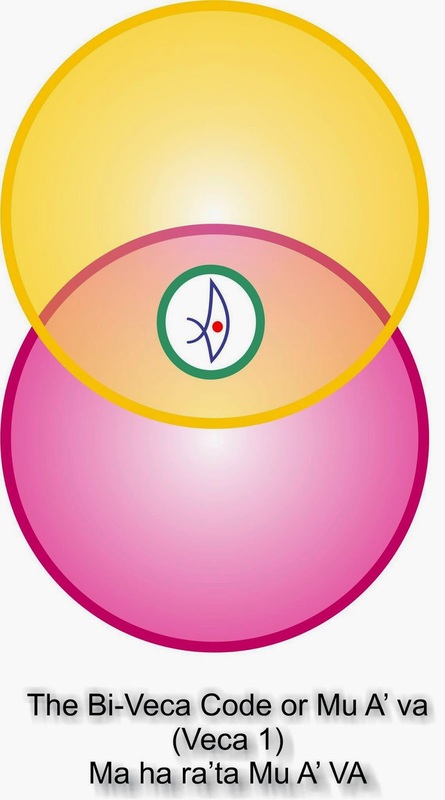 “Death Science” teachings involving the Bi-Veca Code — without its organic Tri-Veca Code counterpart — utilized the distorted energy mechanics inherent to the vesica piscis, by which inorganic, artificial, finite-life static “Dead Light” radiation fields can be generated through corresponding use of distorted Merkaba Vortexmechanics. Once activated, this “Artificial-Light Death Star Merkaba Vehicle,” created through the “Bloom of Doom” and related technologies, engages the finite-life mathematical growth formulae of the “golden mean rectangle” and “Fibonacci spiral & sequence” to increase its spin-speed by draining energy from the life-field around it. Usually, inorganic Death Star Merkaba technologies employ the unnatural spin-speed starting ratios of “34 / 21”in relation to two separate “same-spin fixed-vortex sets” (4 vortices, rather than the organic 2) placed in counter-rotation to each other, which accelerate and blend to a “common spin” of 55 when activated. 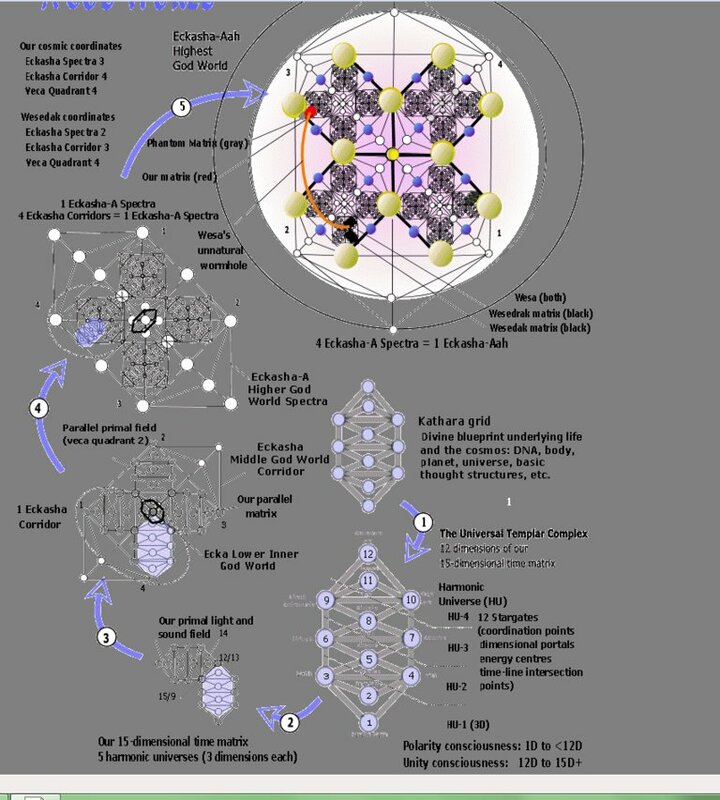 Following activation, the Death Star Merkaba engages acceleration and quantum expansion via the inorganic growth ratios of the Fibonacci sequence, using the “energy sucking” dynamics inherent to the physics-mechanics illustrated within the Fibonacci spiral. Organic Krystar Merkaba Vehicles begin with a natural “331/3– 112/3” spin-speed ratio of a single set of 2 counter-rotating vortices, and build spin-speed and energy thrust to much higher speeds — beyond the known “speed of light” — throughinternal quantum self-generation, following the mathematical correspondences characteristic to the organic “Krystal Spiral and Sequence” growth formula. The “ratio numbers” pertaining to organic Merkaba Vortex spin-speeds refer to the number of rotations each counter-rotating vortex completes in a given period, for a period measured in increments that can be relatively compared to “one rotation per trillionth of a billionth of a nanosecond,” or RP-TBN. Upon full activation, the “Death Star Merkaba Harness Vehicle” and its contents, be it a person, planet or galaxy, can engage limited local interdimensional relocation— but only throughinorganic wormhole, portal and black hole structures formed by the same “Death Science” technologies. Once a biological or matter-form engages full Death Star Merkaba Vehicle activation, its matter-template becomes permanently mutated, and the being or matter-form loses its organic potential of natural multidimensional Ascension, along with the ability to pass through the organic Star-Gate “Ascension Passages” inherent to the Cosmic Templar. Though the Death Star Merkaba offers the “immediate perks” of temporary extension of form longevity and limited interdimensional transport within black hole/ wormhole systems, due to the organic Natural Laws of Physics inherent to the eternal system of the Living Cosmos, the ultimate fate of the Death Star Merkaba is inevitable implosion, energetic self-annihilation and release of its harnessed quanta to space-dust. Use of the Death Star External Merkaba Vehicle can be compared to “taking a poorly planned quantum joyride that inevitably ends in a deadly crash at the end of a dead-end road”; at the least, use of the Death Star Merkaba is a very unwise decision, if one genuinely cares about the potentials of one’s own experiential evolutionary destiny. The distorted vesica piscis Artificial-Light manipulations and Death Star Merkaba mechanics, which are at the core of the ancient Atlantean “Bloom of Doom” and “Death Science” teachings, work together with the distorted matter-template mechanics of the “Tree of Artificial Life,” “golden mean rectangle,” the “Fibonacci spiral & sequence” and other related “Death Science” components not discussed in this writing, to form an inorganic technology that attempts to manufacture an “artificial facsimile of Eternal Life Ascension.”This “facsimile of the sacred” is intended to allow the organic Laws of Energy and Consciousness that govern the eternal Living Cosmos, to be bent, broken, twisted and misused, without truth or consequence, by the whims of finite ego. Beings who knowingly employ this mentality desire to “take a free ride at the expense of whomever or whatever crosses their paths,” without any consideration for “fair or harmoniously balanced energy exchange”; they suffer from a Dis-ease of Supreme Arrogance, through which they become self-deluded into thinking they can escape the organic Natural Laws of Action and Consequence-to-Action by which the eternal Cosmos functions. Such beings inevitably learn, most often the “hard way,” that such “delusions of grandeur,” and the perverse technologies created to fulfill them, simply do not work within the greater structures and context of the eternal Natural Cosmic Laws of Multidimensional Physics — forenergetic action will always be met withcorresponding energetic consequence. The Cosmic Krist Seed Atom (Formally known as the Azur-A) is the Living, Sentient Consciousness Field, formed by the intermingling of the Divine Trinity (ManU-manA-eirA) God Forces, which emerges as an elliptical-sphere-standing-wave-body within the CENTER POINT of the Cosmic Krist Template. The Azur-A or Seed Atom allows the unified Man-u (Holy Spirit) God-force to emerge with the “Eternal INTERNAL Flame” (Amoraea Flame) of God-consciousness, or “open two-way-swinging door” between God-source and Manifestation Fields within IT.Azur-A means the “Center Point of Eternal Creation”. Fuelled eternally by God-Source via the “Eternal INTERNAL Amoraea Flame” at its center, the Cosmic Krist Atom perpetually creates “Replicas” of itself to serve as the “Living Seeds” and Divine Blueprint form and within which Time Matrices, Universes and their inherent matter systems are perpetually born. The Smaller Replicas of the Cosmic Krist Seed Atom are called “Universal Christos Seed Atoms”.Each 15-dimensional Time Matrix is seeded by God-Source and the Cosmic Kristos Seed Atom with ONE Universal Christos Seed Atom.The first Universal Christos Seed Atom perpetually exists and MANIFEST AS the D-12 “Universal Christos” Pre-matter Liquid Light (elliptical) spherical-standing-wave-field; the Universal Christos Field.The Universal Christos Seed Atom of a Time Matrix creates many smaller, individuated, replicas of itself called GOD SEED Atoms or PERSONAL God-sparks that retains the God-Source attributes of the Krist DIVINE BLUEPRINT. The Personal God-spark Seed Atom within the Shield Manifestation Template of an individual exists as the portion of PERSONAL ANATOMY through which the natural energy conduits between the manifest Self, Universal Christos, Cosmic Kristos and the Cosmic Divine Trinity (ManU-manA-eirA) God-force PRIMAL FORCE CURRENTS, remain OPEN. When we talk about the Seed Atom or Azur-A , we inevitably end up talking about the Monad as well, as they are deeply connected, essentially different aspects of the same thing. You can think of the Monad as the light generator, the energy that comes through the template and brings it to life, and the Seed Atom or Azur-A as the core template that energy is beamed through. They are both formed of the same intention, and are just two aspects of that intention that are necessary to create a projected, perceivable hologram or reality field. When you go into your Inner Sanctum (Brehmn – Azur-A), and focus your attention in there, there are a lot of things you can do, like astro project, when you feel exhausted or overwhelmed learning to center you attention and focus in this star of energy inside of you, pulling your attention from your crown chakra and go into your Inner Sanctum when everything else is out there and you are into the quietness and hyper cognition level that can be found in there. This is the best place to learn to communicate with your higher levels or the Guardians. When you go into the Inner Sanctum, you are in the point of connection with the whole Universe. Now let’s investigate the difference between the MCEO teachings that lead us to an energetically eternally self-sustaining path of accretion of our Quanta towards God-Source and the “false” Ascension teachings, which are based on devouring or destruction of existing finite Quanta for the accretion of further new Quanta or in other words death/destruction and re-birth cycles. The “The Tree of Life” teachings that were dispensed by the entity Quetzlcoatl to the Mayan Civilization, in fact, represent The Tree of Artificial Life or Metatronic Death Science technologies. Quetzlcoatl is the same Anunnaki entity who was known as Thoth in a previous incarnation in the Atlantean period and who stole one of the CDT plates that contained some of the MCEO Ascension Science teachings. The Illuminati Elders used that technology to create a Wormhole link between our Earth-Sun-Milky Way Galactic Core and the corresponding Earth-Sun-Milky Way Galactic Core in a Parallel Universe, which is a falling system that is based on Metatronic Death Science. The Illuminati plan to open this wormhole in 2012, when our Earth-Sun-Milky Way Galactic Core come in alignment with the corresponding counterparts in the falling Parallel Universe system. No wonder, there are verses about Wormwood (something that comes through the Wormhole) in Biblical Revealation texts, which is part of the distortion introduced in religious texts as part of the Illuminati Master Plan.If the Illuminati Master Plan was successful, our Solar System and the Parallel Universe Solar System would engage inorganic Metatronic Death-Star Merkaba-vortex dimensional-blend via the Wormhole, which would cause rapid mass extinction of the life fields in both systems, then both solar systems would be “drawn back in time” to the 10,948 BC Atlantean time period of just before when the wormhole link was created. However, this Illuminati Master Plan will not succeed, as they will soon find out. Due to the GA-MCEO Guardians’ intervention efforts, the Illuminati’s wormhole link opening event will not proceed to completion in 2012, but will instead be postponed to about AD 2230. The MCEO Guardians have progressively activated a very ancient network of trans-dimensional Earth Interface Star-Gates which include the “Arc of the Covenant–Hub Gate Network,” the “Polarian Gate System,” and the “Na-VA’-Ho Spanner Core Gate System,” which together, in 2012, will allow for the opening of the “Aurora Silver Seed Gates,” through which Earth’s Templar can retain direct connection to the Living Cosmic Templar Ascension Passages, despite the Illuminati’s scheduled 2012 opening of the Fall-aligned wormhole.These gates will remain open for the next 200 years. In 2012, the Guardians will introduce an Expedited Bio-regenesis Healing technique called the “Silver Seed Awakening”, through which accelerated reverse-mutation of the DNA Template can occur, to allow reclamation of the organic ability of Ascension through atomic Transfiguration.This “200-year window” will enable humans, both of the “Angelic” and “Illuminati-Human” lines on “Amnesty Contracts,” who engage the “Silver Seed Awakening Healing” at its initiation in 2012, to heal their atomic-biology and Encryption Lattice sufficiently to engage biological “Star-Gate Slide Ascension” into the nearby “Free Worlds” and the “Path of Re-evolutionary Ascension” within which these worlds reside. Contemporary Earth is presently a “Blended System” with over 66% of its Encryption Lattice in Fall System BPR alignment. If the fall alignment percentage remains at the same high levels in 2012, Illuminati’s strengthened environmental electro-magnetic Metatronic Time-Harness in 2012 might induce an automatic “Metatronic 55-Blending Ratio” permanent DNA mutation in all life forms. 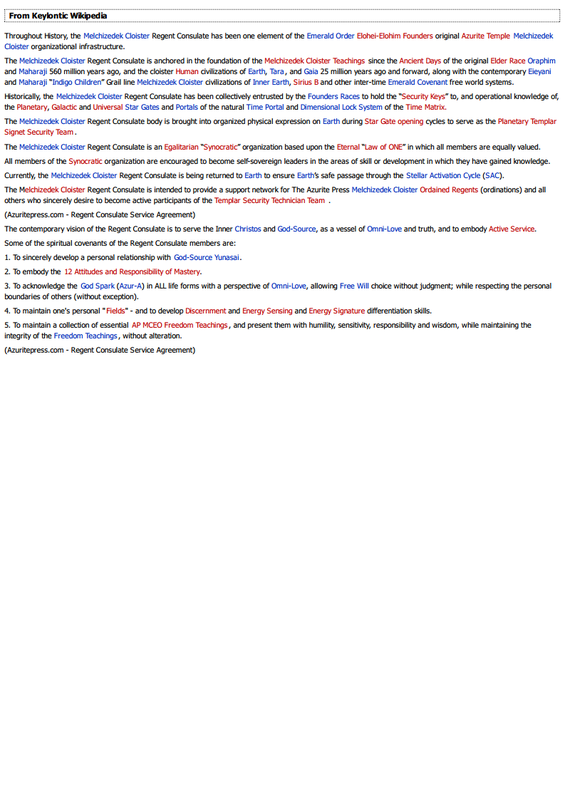 However, Individuals who make choices that allow their personal Encryption Lattices to enter Co-resonant Harmonic Alignment with the Guardians’ Stardust Ascension Grid between December 21, 2012 and January 31, 2013, will receive the gift of the “Silver Seed Awakening”, which will create progressive biological immunity to the Illuminati’s environmentally induced automatic “Metatronic 55-Blending Ratio” permanent DNA mutation. So, what can a caring humanity do “in the meantime”, in preparation for 2012 and beyond? In short, the answer is to make positive, love-based, joy-filled and wise choices in life, in preparation for, and following 2012, which will provide the opportunity for us to SHIFT ourselves into a more desirable evolutionary alignment than that of the “Path of Fall,” with which the primary quanta of Earth are now engaged due to the 66% quantum alignment of Earth’s Planetary Encryption Lattice, and geomagnetic field, to the Metatronic Code. An example of a wise choice would be to refrain from engaging in Metatronic Death Science based “false” Ascension teachings. Pointers have been provided in the above linked summary #2, on how one can discern between “true” and “false” ascension teachings. Eg: if one sees constructs such as the “tree of Life”, “Fibonacci Sequence” or “Golden Mean Rectangle” used in the teachings then that paradigm is definitely based on Metatronic Death Science.Within the intensive studies of “Cosmic Context, Structures and Dynamics” progressively featured in the MCEO teachings, we have learned of the intricate genuine “Sacred Geometries” inherent to personal and cosmic structure, and the corresponding Sacred Processes of Physics and Consciousness—such as Partiki Phasing, Takeyon Harmonic Key Cycles and Eckashi Expansion & Adashi Return Cycles — which are interrelated elements of the organic cycles of growth that govern cosmic formation, biological creation and spiritual evolution. We have also learned of the “nature of space-time,” and of both the small and massive organic multidimensional “time cycles” that govern space, time, matter, consciousness and manifestation.Progressively since 2000, the CDT-Plate translations and MCEO teachings have revealed many long-hidden secrets pertaining to the “Science of Ascension,” which includes the organic processes of interdimensional and trans-dimensional atomic Transmutation, Transfiguration, Translocation and Transmigration. In our learning of the actual organic processes by which—and cosmic structures through which—the bio-spiritual dynamics of “Ascension” can occur, we have also received an extensive amount of information on the intentional historical distortions of “Ascension Science teachings.” Through learning about the organic intricate structures, genuine processes and Natural Laws of Multidimensional Physics through which actual “Bio-Spiritual Ascension” (for “planets or people”) can take place, the falsehoods carried within “false Sacred Science” teachings became progressively more obvious by comparison. “False Sacred Science” teachings, and the inorganic environmental and biological consequences created through their use, are built upon convoluted, self-serving perversions of the organic Laws of Multidimensional Physics. Applications of these “twisted multidimensional science” teachings, historically engaged on Earth throughout different periods over many thousands of years, has taken a terrible toll on human evolution and on the state of our planetary environment. The “false Sacred Science” teachings emerged from periods in our ancient and pre-ancient past, during the historically ignored “ancient advanced Earth cultures” currently associated with “Atlantean and Lemurian mythology.” During these ancient times, many environmental and biological horrors were created through application of the “false Sacred Sciences”; the technologies that emerged from these teachings represented a perversion of the organic, living multidimensional technologies that were once available through applications of genuine “Sacred Science.” In ancient advanced cultures, the “false Sacred Science” teachings became known as the “Death Sciences,” because reduction of eternal-life potential to finite-life de-evolution was the eventual result of their applications—regardless of what temporary benefits of finite power such technologies supplied. Two other components of the Atlantean “Bloom of Doom” teachings, and related “Death Sciences,” are hidden within two common symbol-forms referred to as the vesica piscis and the “star-tetrahedron.” The “vesica piscis” symbol is a set of 2 interlinked circles with the inner-most “outside edge” (circumference) of each circle touching the center-point of the other circle. Within the CDT-Plates, this symbol was originally called the “Bi-Veca Code,” and it, along with its 3-circle Tri-Veca Code symbol counterpart, referred to specific organic structures, processes, functions and interrelationships inherent to the organic multidimensional electromagnetic frequency spectrum, and especially to the organic creation mechanisms and natural dynamics inherent to light-radiation and the organic Living Light structures upon which the eternal Cosmos is built. The “star-tetrahedron” symbol is a 3-dimensional symbol-form constructed of 2 pyramidal-shaped vortices, each with a triangular base: one pyramidal-vortex is in the “point-up” upright position and intersects along a vertical line with the other inverted, “point-down” pyramidal-vortex. The 2-dimensional depiction of the star-tetrahedron is the commonly recognized symbol of the “6-pointed star” or “Star of David.” Within the CDT-Plates, both versions of this symbol were depicted with a circle around the symbol, and both were referred to as the “Hierophant” symbol, which depicted the mathematical formulae and multidimensional structures inherent to “Merkaba Fields.” Merkaba Fields are organic energy vortex structures that are part of the natural multidimensional “circulatory system” of the Living Cosmos, and which under certain conditions inherent to the Natural Laws of Multidimensional Physics, can become “vehicles of transport” within the organic processes of Genuine Ascension. The Bi-Veca Code/“vesica piscis” and the Hierophant 6-pointed star/“star-tetrahedron” symbols, and the “Ascension Science” teachings corresponding to them, were part of the original “Sacred Science” teachings contained with in the CDT-Plate that was stolen during the Atlantean period. In the hands of the Illuminati, the Bi-Veca and Hierophant symbols and their corresponding bases of knowledge were, like the “Kathara Grid” and “Krystal Spiral,” distorted: first into the “Bloom of Doom” technologies, and later into a variety of “Death Science” teachings and practices used by competing Illuminati groups in their quest for Earth Templar control. Unlike the visibly discernible distortions of the Kathara Grid and Krystal Spiral symbols, Bi-Veca Code and Hierophant symbol distortions were not immediately noticeable; instead, the distortions were contained within the twisted teachings of finite-life energy mechanics that accompanied the symbols, while the image of the symbols themselves looked relatively the same. 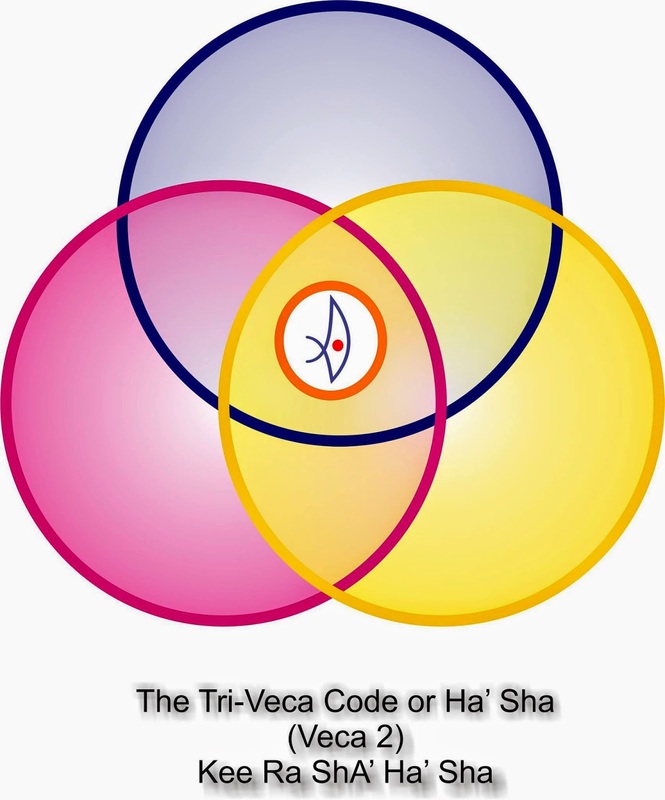 “Death Science” teachings involving the Bi-Veca Code—without its organic Tri-Veca Code counterpart—utilized the distorted energy mechanics inherent to the vesica piscis, by which inorganic, artificial, finite-life static “Dead Light” radiation fields can be generated through corresponding use of distorted Merkaba Vortex mechanics. Upon full activation, the “Death Star Merkaba Harness Vehicle” and its contents, be it a person, planet or galaxy, can engage limited local interdimensional relocation—but only through inorganic wormhole, portal and black hole structures formed by the same “Death Science” technologies. Once a biological or matter-form engages full Death Star Merkaba Vehicle activation, its matter-template becomes permanently mutated, and the being or matter-form loses its organic potential of natural multidimensional Ascension, along with the ability to pass through the organic Star-Gate “Ascension Passages” inherent to the Cosmic Templar. Though the Death Star Merkaba offers the “immediate perks” of temporary extension of form longevity and limited interdimensional transport within black hole/wormhole systems, due to the organic Natural Laws of Physics inherent to the eternal system of the Living Cosmos, the ultimate fate of the Death Star Merkaba is inevitable implosion, energetic self-annihilation and release of its harnessed quanta to space-dust. Use of the Death Star External Merkaba Vehicle can be compared to “taking a poorly planned quantum joyride that inevitably ends in a deadly crash at the end of a dead-end road”; at the least, use of the Death Star Merkaba is a very unwise decision, if one genuinely cares about the potentials of one’s own experiential evolutionary destiny. 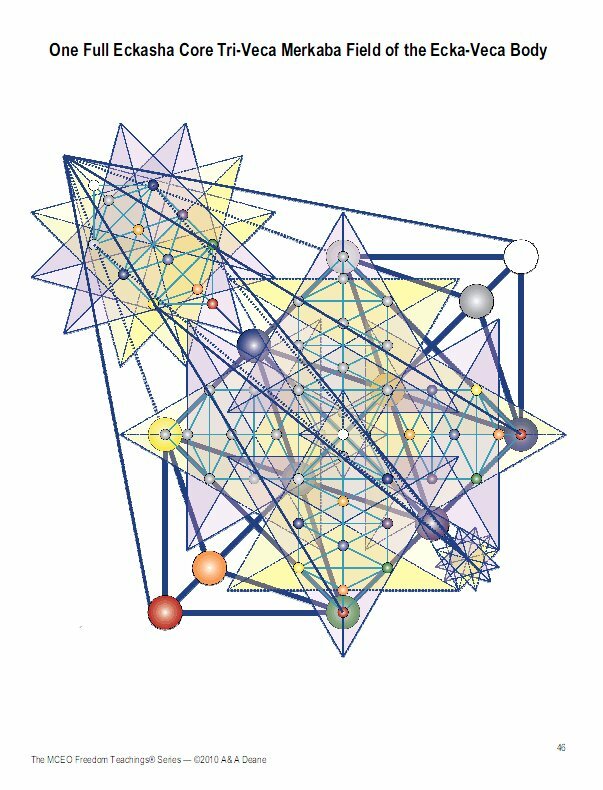 Metatronic Death Science,” named after a local entity collective, called “Metatron,” who was instrumental in bringing the Death Sciences more directly into our local Galaxy. In reality, the Death Science teachings and technologies progressively mutated the DNA, and entrapped the consciousness within a biologically-induced state of false euphoria—while systematically dissolving the organic evolutionary potential to achieve Genuine Eternal Life Bio-Spiritual Star-Gate Ascension. The ancient Illuminati races of the Atlantean period promoted the Death Science technologies precisely to achieve these results, for their true motivation and intention was not at all to “assist the human race” in aspiring to its potential “evolutionary glory”; the Illuminati agenda was to covertly USE the human race as “unwitting, expendable tools,” through which the Illuminati goal of achieving Earth “Templar Dominion” could be fulfilled.